Knuffle Bunny: A Cautionary Tale. Trixie lives in Brooklyn, NY with her mom and dad. She loves helping her dad run errands, like going to the Laundromat. Trixie always brings along her beloved Knuffle Bunny, but when he gets left behind, she can't find the words to tell her dad what happened, instead trying to make him understand "Aggle flaggle klabble!" Will Trixie's father understand her and help her find Knuffle Bunny again? Knuffle Bunny Too: A Case of Mistaken Identity. Trixie is excited to start school and show off Knuffle Bunny to all her friends. When she gets to class, she is upset to find Sonja has her own Knuffle Bunny! They fight and the teacher takes their bunnies away - will they get them back and become friends? Knuffle Bunny Free: An Unexpected Diversion. Trixie is older now, and her family is going to visit Oma and Opa in Holland. Knuffle Bunny comes along for the trip, but never makes it off the plane. Her grandparents try to make her happy with a replacement Knuffle Bunny, one that walks and dances and speaks (in Dutch). It’s cool, but it’s not Knuffle Bunny. Is Trixie mature enough to live without her best and oldest friend? The Knuffle Bunny trilogy consists of three very unique books, with Willems drawing his illustrations on top of black and white photographs. This is something that might not be noticed by children, but it's such a pleasure for adults to look at, because there's so much to see in each photograph, and Willems' illustrations add even more to the pages. No detail gets by Willems - he adds his characters' shadows to make it seem like they actually belong in each picture. The font is perfect all around: it looks great with the drawing style, is laid out nicely on the page, and is big enough to children to see. Even those too young to read are pulled in by the words because, at least in the case of my son, the large, comic-looking font just begs to be touched! The page backgrounds are muted, solid colors to ensure the text and illustrations take center stage. Until having a baby, my experience with contemporary picture books has been extremely limited to buying a book for my nephew's birthday and Christmas gifts. The children's lit course I took in undergrad mostly focused on the origins, the classics, and the retellings of fairy tales and more traditional children's literature. Literature for Children and Young Adults (5603), which I took the Fall 2014 semester, really opened my eyes to what's out there today. I'm sure I would have stumbled upon a lot of new books as I browsed the stacks with my son in mind, but the reading list for 5603 was impeccable; I'm keeping it to go back and read other suggestions from it as I have time. All that is to say, I never read a Mo Willems books before last semester. The horrors! No, I don't think you're judging me - I literally mean, the horrors! I can't believe I was missing out on such treasures. I read Goldilocks and the Three Dinosaurs for class and fell in love with the whimsy of Willems, then checked out The Pigeon Needs a Bath when I saw it on display at the library. That reminded me that we need mo' Willems (I'm sorry, I had to!) in our lives. 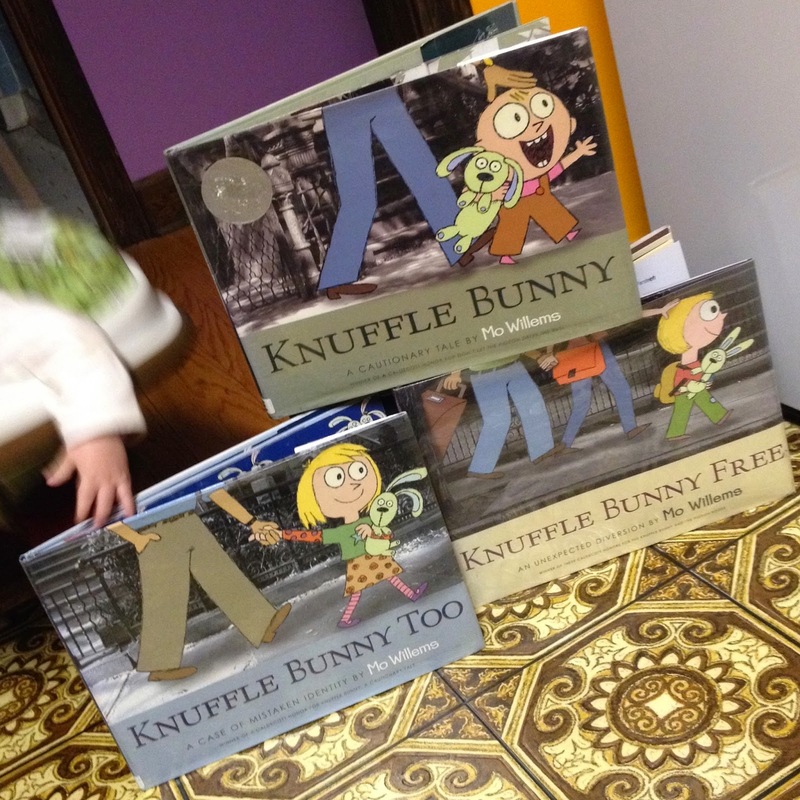 We picked out Knuffle Bunny and Knuffle Bunny Free without realizing it was a trilogy, so we requested Knuffle Bunny Too from another branch. My 6-month-old seemed to love the illustrations, and when I read it aloud to my 5-year-old stepson, he had fun taking in every aspect of the pictures. He searched for Knuffle Bunny when he was lost, and tried to predict what would happen next based on the drawings. Days after we read them, he was still talking like Trixie in the first book: "Aggle flaggle klabble!" 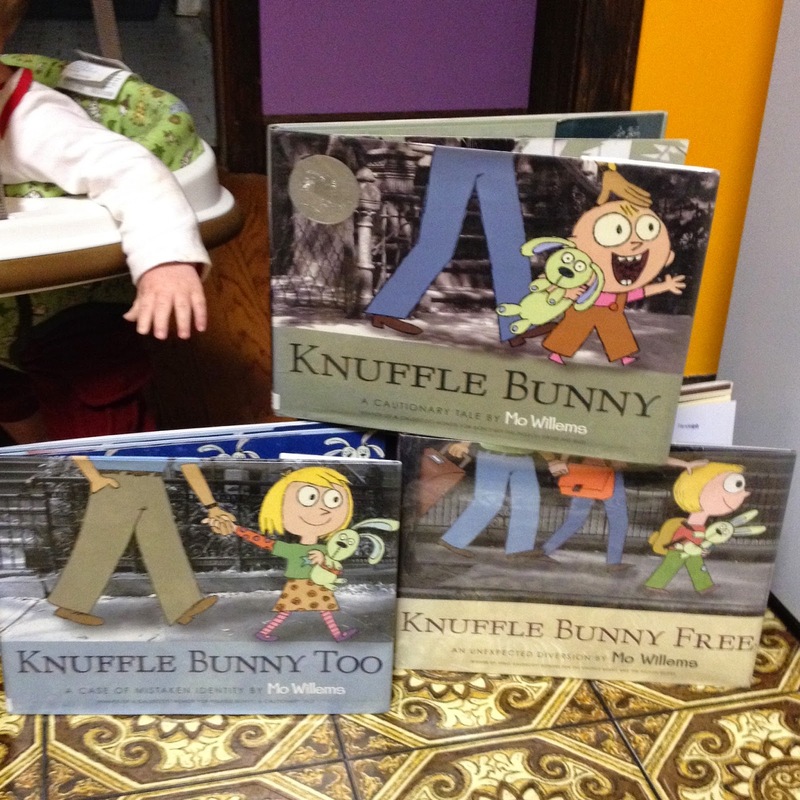 Knuffle Bunny and Knuffle Bunny Too are both Caldecott Honor books. All three books are New York Times bestsellers. The first book has been made into a short film and a musical, and stuffed Knuffle Bunnies are also available. Willems was a finalist for Illustrator of the Year during Children’s Book Week in 2011. Willems, Mo. 2004. Knuffle Bunny: A Cautionary Tale. New York: Hyperion Books for Children. Willems, Mo. 2010. Knuffle Bunny Free: An Unexpected Diversion. New York: Balzer + Bray. Right before they came tumblin' down!